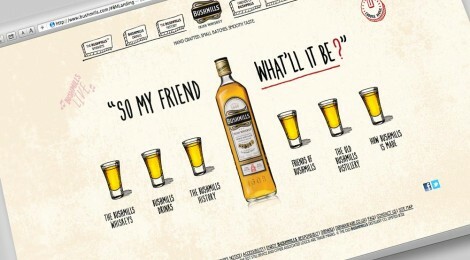 Out with the old and in with the new… The new Bushmills site just went live! Hurray! The brilliant team at Pulse put together a stunning look and a fun brand site. I helped shape the technical side of the brief for the internal agency teams – moving from flash to HTML5 for great animation and interactivity that works on desktop, tablet and mobile. And making sure that the music player would work continuously as users navigate the site, on any gadget. Then also helped out with site testing, debugging, fixing code to meet brand guideline requirements and deploying the site. During the brief phases, I found ways to insure and guide creative options so that the site would embrace HTML5 and reject Flash. During the build phase, I helped proof the technical build to insure high standards are met, along with the legal requirements of a working gateway to be sure only people of legal drinking age view the content… while the search engines scan it all. During the deployment stage, I worked with developers to make some technical changes to suit the brands hosting guidelines and trained up new teams to understand deployment processes for this world recognised brand. After launching the main site, we also did a mobile version, and a “Bushmill’s LIVE” Facebook App for music and whiskey fans to see big name bands play exclusive shows in the distillery, which ran for 3 years (so far) internationally across to globe. Check their Facebook pages in early spring to find out more.